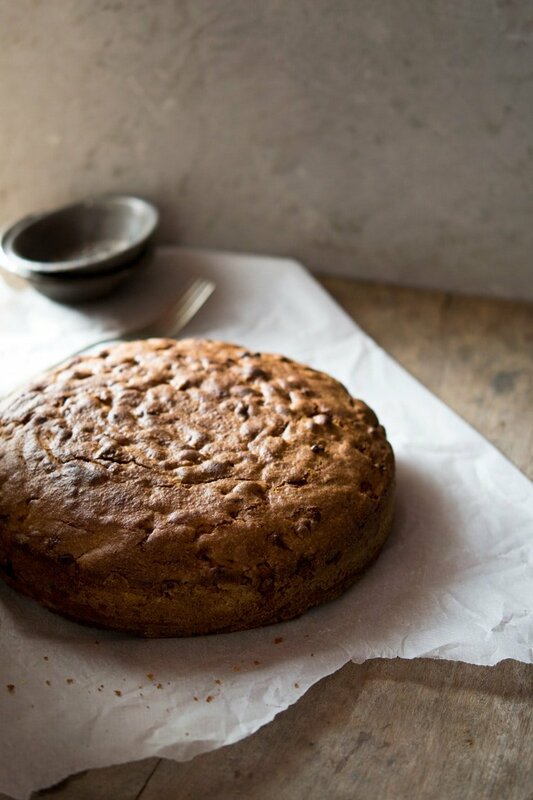 Apple Olive Oil Cake made with cinnamon, apples, and sultanas it’s moist, soft and delicious. This cake is perfect after a meal with some cream or ice cream or for breakfast with a cup of coffee. Isn’t the world a better place when there’s cake? To celebrate the end of summer (sort of) I’ve been baking with all things Autumn. Opening that spice jar filled with cinnamon just brings me so much joy and so does this easy apple olive oil cake. I love that this cake is made with olive oil instead of butter, it makes the cake so moist and soft and gives it a wonderful depth of flavour. It has no icing or frosting on top making it great for breakfast and there really isn’t any better motivation for getting out of bed than a cinnamon scented apple olive oil cake and a cup of coffee, right? Although this cake is extremely easy to make don’t be fooled by its very thick almost cookie dough like batter. Also don’t be tempted to add water to loosen it, it’s exactly how it should be. When you add the chopped apple and sultanas just keep folding the batter with a metal spoon until it’s all thoroughly combined. Tip: The golden sultanas give a wonderful sweetness and bursts of flavour to the cake, make sure to soak them in warm water 10-15 minutes before adding them to the batter to soften them. Ok, so the hardest part about this cake is waiting for it to cool down. I have been known to cut into it while it’s still warm from time to time and although it’s so delicious whilst warm it can dry the cake out if it’s cut too early. So if you’re not planning on devouring the whole thing whilst it’s still warm then wait, patience is a virtue and all that! If you don’t have a sweet tooth in the mornings then this is also great after dinner with a splash of cream or a dollop of vanilla ice cream. You might already know that I’m totally a cheese over chocolate kinda girl but for some reason, occasionally after dinner I get an insane sweet tooth, if there’s something sweet in the house then I’m coming for it. 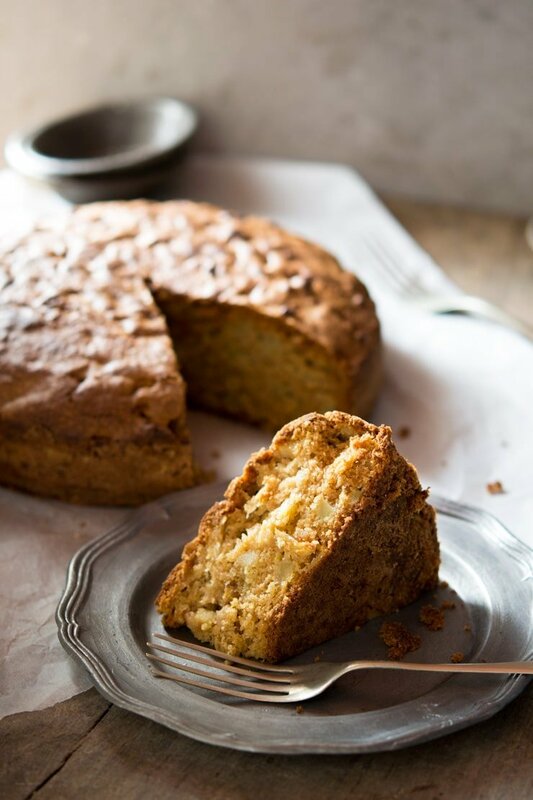 This apple olive oil cake has been so perfect for me recently because I can have a small slice after dinner and a large slice in the morning, happy days! Luckily for me, I have a boyfriend with a large appetite or I would eat the whole thing by myself in about 2 days. Oh and just in case you’re not as glutinous as me it also keeps well for a couple of days wrapped in cling film or stored in an air tight container. 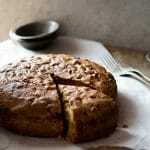 Apple Olive Oil Cake made with cinnamon, apples, and sultanas it's moist, soft and delicious. This cake is perfect after a meal with some cream or ice cream or for breakfast with a cup of coffee. Preheat the oven to 180°C/350F/gas mark 4. Grease an 8inch/20cm cake tin with butter then dust with flour making sure all the edges are covered, remove any excess flour. Soak the sultanas in warm water for 10-15 minutes. Put the olive oil and sugar in a bowl and using a stand mixer or electric whisk mix together for 2 minutes until thoroughly combined. Add the eggs one at a time and continue to whisk until the mixture increases in volume and becomes thick but still runny (around 1-2 minutes). Add the flour, cinnamon, baking powder, bicarbonate of soda to a bowl. Gradually sift the dry ingredients into the wet whilst folding the mixture with a metal spoon. Once combined (it will be a thick, stiff batter) add the sultanas, apple and lemon zest to the batter and mix with a metal spoon until thoroughly combined. Spoon the mixture into the cake tin and level the top with the back of a spoon. Bake in the oven for 45 minutes or until an inserted skewer comes out clean. Store the cake in an air tight container or tightly wrap in cling film for up to 2-3 days. Store in a cool dry place. I would have the hardest time not cutting into this cake immediately! I also have never tried making an olive oil cake before so I definitely need to give this a try! I’ve never made a cake with olive oil but I love the idea! And with apples being in season, this is perfect! Apples and olive oil must make for a deliciously moist cake! It is absolutely beautiful and I’m ready for these fall flavors. Thanks for sharing! No problem Tricia, I’m ready for all things fall too! A lovely recipe for a tasty cake. Great to have for a tasty mid morning treat with good coffee. I imagine it would be wonderful warm with ice cream or cream. i love the light you’ve got in these images – they really make the cake stand out from the crowd. My husband has a soft spot for Dorset Apple cake since he’s from Dorset. I’m going to make your apple cake for him next though, since it looks and sounds so good. I’m sure he won’t mind a change from the usual. 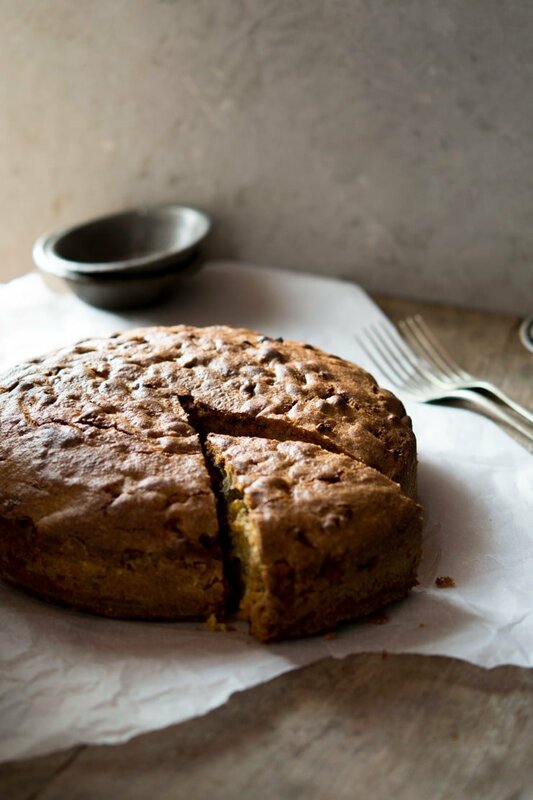 Sounds like a great cake for autumn, loving the spiced flavours! Thanks Amy, I wishing for Autumn to come along asap!